Ḥamzah Sulṭān, Mahdī Sulṭan and Mamāq Sulṭān Pay Homage to Babur, from Illuminated Manuscript Baburnama (Memoirs of Babur). Walters Art Museum, Baltimore, MD. Animals of Hindustan Monkeys, Rodents and the Peacock, from Illuminated Manuscript Baburnama (Memoirs of Babur). Walters Art Museum, Baltimore, MD. Babur and His Army in the Sinjid Valley on the Way to Kabul (Memoirs of Babur). Walters Art Museum, Baltimore, MD. Babur, and W. M. Thackston. The Baburnama: Memoirs of Babur, Prince and Emperor. Washington, D.C.: Freer Gallery of Art, 1995. Babur Confronts His Enemies in the Mountains of Kharābūk and Pashāmūn, from Illuminated Manuscript Baburnama (Memoirs of Babur). Walters Art Museum, Baltimore, MD. Babur Entering Kabul, from Illuminated Manuscript Baburnama (Memoirs of Babur). Walters Art Museum, Baltimore, MD. Babur Supervising the Laying out of the Garden of Fidelity. Victoria and Albert Museum, London. Accessed August 22, 2010. http://collections.vam.ac.uk/item/O114438/painting-babur-supervising-the-laying-out/. Babur's Enthronement. In University of Washington's Silk Road Exhibit. Accessed August 22, 2010. http://depts.washington.edu/silkroad/texts/babur/babur1.html. Celebration in the Charbagh Garden of Kabul on the Occasion of the Birth of His Son, Humayun in 1508. In University of Washington's Silk Road Exhibit. Accessed August 22, 2010. http://depts.washington.edu/silkroad/texts/babur/babur1.html. Cover Page, Baburnama. In University of Washington's Silk Road Exhibit. Accessed August 22, 2010. http://depts.washington.edu/silkroad/texts/babur/babur1.html. Dynamosquito. "Immortels." Digital image. Dynamosquito's Flickr Photostream. Accessed August 22, 2010. http://www.flickr.com/photos/dynamosquito/4489670087/. The Final Phase of the Battle of Kandahar on the Side of the Murghan Mountain, from Illuminated Manuscript Baburnama (Memoirs of Babur). Walters Art Museum, Baltimore, MD. Illuminated Manuscript Depicting Babur's Defeat of the Afghans at the Jagdalek Pass, from Baburnamah. Walters Art Museum, Baltimore, MD. Illuminated Manuscript Depicting the Fall of Samarkand from Baburnama. Walters Art Museum, Baltimore, MD. Jan, Mira. Field Recordings: Hiromi Lorraine Sakata. Performed by Abdullad of Qandahar. Tirin Hotel, Orzgan Province. Sakata Music Collection, 1967. Kelly, Jim. "Babur Gardens from a Mountain Top." Digital image. Wikipedia Commons. Accessed August 22, 2010. Muḥammad Ḥusaym Mīrzā, a Relative of Babur, in Spite of His Treachery, Is Being Released and Send to Khurāsān, from Illuminated Manuscript Baburnama (Memoirs of Babur). Walters Art Museum, Baltimore, MD. Muscats (from Baburnama). Walters Art Museum, Baltimore, MD. Music: Jam (India), Baburnama. Walters Art Museum, Baltimore, MD. Shoe Buckles Depicting a Chariot Drawn by Dragons. 1st C. CE. National Museum of Afghanistan, Kabul, Afghanistan. The Siege and Battle of Isfarah. Babur and His Army Assaults the Fortress of Ibrāhīm Sārū, from Illuminated Manuscript Baburnama (Memoirs of Babur). Walters Art Museum, Baltimore, MD. Sultan Muḥammad Vays Offers Babur a Healthy Horse to Replace His Ailing One, from Illuminated Manuscript Baburnama (Memoirs of Babur). Walters Art Museum, Baltimore, MD. UNESCO/Manoocher/Webistan. Kabul Museum - Statue Restoration. Kabul. Wyoming_Jackrabbit. "Herodotus, Historiae." Digital image. Wyoming_Jackrabbit's Flickr Photostream. Accessed August 22, 2010. http://www.flickr.com/photos/wy_jackrabbit/4339298688/. What is known about Afghan history is typically pieced together. Unlike the Greek or Chinese Empires, there were no known scribes nor mapmakers. What we understand about Afghan history was often derived from foreign sources or visual clues. That is, until the time of Babur. The Baburnama was the first autobiography in the Muslim world. The narrative chronicles how one prince adopted a home in Kabul and founded the last Indian Dynasty. It is a remarkable story. He wrote an extraordinary autobiography, which tells us a great deal about a cultured man. He and his successors introduced a level of Persian sophistication into Northern India and founded the last dynasty of India, the Mughal Dynasty. A descendent of Ghenghis Khan and Tamerlane, he had the blood of a Turkic warrior, but the prose of Persian nobility. The story starts when Babur was 12. His father had died and he inherited–and lost–a kingdom in the lush Ferghana Valley north of Afghanistan. As a teenager, Babur the prince was victorious at times, but the victories were short lived. He captured Samarkand, only to lose it. He would stew then re-attack. In his early twenties, Babur seemed to strategize more. He took to the forests, where he lived for three years, slowly building and training an army. He had an Empire to establish. While in Kabul, he lays out a garden. Gardens which were part of his homeland and which he missed. They tend to be walled enclosures with water channels that run at regular intervals, cross-sections. And that’s exactly what we see in Babur’s garden, which has terraces with water that runs, running water, because water adds sound, background noise, but also cooling, fragrance, all the senses. It shows what an important role gardens play in this whole part of the world. If you look at the landscape, you’ll see why gardens are so important. The landscape is sear. It’s dark. It’s dusty. If you bring water, it’s fertile. So water becomes the image of paradise. The Garden of Eden, the Promised Land. Despite his adoration of Kabul and his garden, he was not ready to retire. He conquered Kandahar, another wealthy city along prosperous trade routes. Babur had grown to become a powerful and wealthy King. He crossed the Oxus River and conquered his ancestral lands of the Ferghana Valley. He then set his sights on India. At this point in history, warfare had changed profoundly. He used new technologies and his battalion of 12,000 was able to defeat an army of 100,000. He sacked what is today Northern India. He and his descendants ruled the subcontinent for three centuries, instilling a legacy of Persian culture and Islamic faith. "If there is a paradise on earth, it is this, it is this, it is this!" Babur died in Northern India, but was later brought back to Kabul and was laid to rest in his beloved garden. Times changed, and so did the garden. Natural disasters and decades of war have ravaged the site, returning it to a dusty landscape. Over the years, there were several efforts to restore the garden. They [gardens] change, from day to day, form season to season. And we have no idea what gardens looked like. So any time we see a garden, that’s only the seasonal aspect. We have depictions of them in miniature paintings, but again, these are probably idealized, because they often show plants that don’t bloom or blossom at the same time. The latest effort to renew the garden is by the Aga Khan Development Network. As Babur’s Gardens are renewed, so, too, is Kabul’s cultural heritage coming back to life. 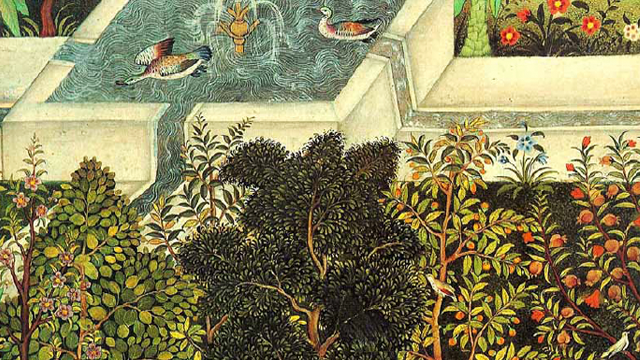 At times, it seemed the world was Babur's garden.